The coat, almost woolly in texture, shades from brown to yellowish brown. The stags are maned and darker in colour. The summer coat of stags and hinds is paler, some develop spots, not always distinct, of lighter tone. The young are spotted. There is much variation in the form of the antlers. Two distinct types are recognised with a wide range of intermediary patterns. In the first form, the beam takes a backward and then forward curve bringing the points of the horns in line with the top of the head. Half way up the beam, tines are given off at intervals, the first usually having a shoot of its own. In the second and far handsomer type, the browtine is set at right angles to the beam, which grows with an outward curve giving the antlers a wider spread. At the point where it branches, the beam takes an almost horizontal curve and gives off a number of vigorous vertical tines each of which throws out shoots. 10 to 14 is the usual number of points, though there may be as many as 20. Three races of the Swamp Deer are now recognised - the northern duvauceli of the 'terai' in Uttar Pradesh and Nepal; an eastern race ranjitsinhi in Assam, and a southern race branderi found in the hard open ground of Madhya Pradesh. The northern and eastern races are true Swamp deer inhabiting marshy ground and their hooves are longer, splayed out and spongy while the southern race primarily inhabits harder ground in the 'maidans' or short grass meadows. As a result the hooves of this race are harder and smaller. In the 'terai' the Barasingha lives on marshland and is seldom out of water. 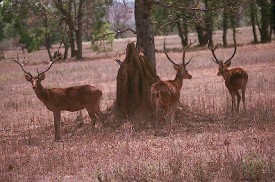 In Madhya Pradesh these deer inhabit grassy 'maidans' in the proximity of forest where they appear to be less dependent on water than Chital (Cervus axis) or Spotted Deer. Their habitat in Assam is high ground in the proximity of water. Swamp Deer are highly gregarious. In parts of the 'terai' a few miles of swamp may contain hundreds of these magnificent animals. Swamp Deer are less nocturnal than Sambar(Cervus unicolor). They feed till late in the morning, again in the evening, and lie up during the day. Their eyesight and hearing are moderate, the sense of smell acute. When alarmed the whole herd sets up a deep baying sound which can rise to a hoarse scream and is continued in flight. They live more or less in amity till the rut develops. Both races of the Swamp Deer are considerably reduced in number with only about 500 of the central Indian race surviving with the entire population numbering less than 5000. The main threat to Swamp Deer is destruction and degradation of habitat. The grasslands and alluvial marshes that are their habitat are also those that are most coveted by humans. This is the reason that has swept this once abundant species of the alluvial flood-plain and grassy forest clearings to the edge of oblivion. The most threatened population is the Central Indian race with less than 500 surviving in Kanha National Park. The recovery of this population from less than 70 animals in the 1970's to the present number represents a major conservation success that was accomplished by careful management founded on good science. It was realised that grassland degradation was the main threat and so large enclosures were constructed to allow grasslands to recover, strict control exercised over annual burning and grasslands augmented by the relocation of the villages of Sonf, Bishanpura and Gorhela. Further a 10 km. long corridor was created between Kanha and Bishanpura meadows to allow the deer to colonise this area where they now thrive. Their other major stronghold is the Sonf meadow which has been closed off since 1994 to isolate the deer from disturbance. In the north, Dudhwa, although famous for Tigers, was created primarily as a haven for the disappearing Swamp Deer and is one of the last places in the Indian 'terai' where it is still possible to see large herds. Swamp Deer are also found in Bardia and Suklaphanta in Nepal, besides the Kaziranga population, which is however a different subspecies.